Reading the book “Down these strange streets” this autumn, for the Lord John novella lead me to discover Patricia Brigg and her Mercy Thomson serial. I´ve read the whole lot through at least twice now.She is as compelling a writer as our beloved Diana, in her own way. I´ve now started on the Briggs “stand-alones”, while waiting for our next greeat reading experience with Jamie and Claire. Thanks to Diana I´ve also discovered Rrickman earlier and has fallen in love with Merrily as well. Dianas recommendations has so far always turned out to be good reading. Thanks for the Methadone list! It´s a great relief while waiting. Thanks for this recommendation Diana, I’m always on the lookout for something new to read! I also agree with Deb, Jim Butcher is an author I would also recommend. Btw, kudos on The Scottish Prisoner! I bought my copy and began reading the same day. Couldn’t put it down! Had it read by the next morning. Very much looking forward to Written In My Heart’s Own Blood. Well, on your recommendation Diana I have read several Christopher Brookmyre books, and they are just wonderful. His stories have fascinating characters and plots. Everyone I have read has been a wonderful read. So I think I will have to add this author to the pile of “To Be Reab” books on my nightstand. I’m loving Phil Rickman! Thanks, Dianna, for a new author to devour. Especially appreciate good writing in a series with characters one can love that evolve and grow throughout the books. And Hereford area is a very beautiful part of the country. Glad the Meth. List is growing. Try Audible – they have several of his books. I just finished reading the Echo in the Bones, and I feel that you have left me hanging. The story did not seem to be completed to the point of your previous books. Unknown what happens to little Gem etc. When will this book be continued? Thanks for having this blog. I’ve wanted to find a way to say this to you for a while…and here you are! I just needed to say that the last several years have been very difficult for me, filled with much anxiety. But, I’ve grown to love and appreciate Claire, who has seen me through the worst of it. And, even today, when things are generally better, I still think to myself on the way home from work – I really need to talk to Claire! So many nights I’ve fallen to sleep with my iPod running and Davina’s voice and your words running through my mind. It’s nice to be comforted by a strong woman who knows herself and loves her family. I can’t seem to find an answer to this question so I do apologize if you’ve written it previously. When I borrowed Cross Stitch from my local library, I noticed that Jamie’s uncle’s name was spelled Callum but when I went onto the subsequent books, his name was spelled Colum. Do you know why it was different in Cross Stitch? I very much appreciate your talent and hope you get as much enjoyment from writing your books as I do from reading them. Cheers! So, you would potentially re-read them?? ?hmmmmm sounds like another author I’ve come to love. I bought Outlander at the recommendation of a clerk at a book store since the one I was looking for wasn’t in…it sat on my bookshelf for a year. Then, with nothing else to read, I picked it up. I finished 4 days later and I’m not sure if my 18 mo. old at the time had his diaper changed or if he was fed. I’ve read and re-read them all 4 times and listened to them from audible or wherever I could find them. We now have 5 kids that are 5 years and younger…our triplets just turned 7 months. Jamie, Claire and all the rest kept me company during bed rest, night feedings, etc. Where can I find the recipes used by Herself Dianna, for Christmas 08? They look pretty good to me! I ordered a copy of Wine of the Angels from Amazon, It is wonderful. OMG, Oh, my goodness. Love Merrily and her relationship with her daughter. Such saturated writing. Thanks for the suggestion. I’ve just finished once again reading sequentially all the Outlander books (well, with a short side trip for Scottish Prisoner!). Thank you; it was a wonderful and enriching trip! I was surprised to learn I had (apparently!) power read (What Happens Next???!) through so fast I missed many special experiences! A wonderful treat! And now on to Phil Rickman’s goodies … thank you, also, for that! May I offer a suggestion or two? I love the name Bryony … and, if I ever again have a white “puff” kitten, her name will be Dandylion; Dandy for short! Then again, with three kittens, there’s hippopotamus … Hippo, Pot, and Amos! Sorry … waffling off to Sillyland! Enjoy a Great Birthday Month! I’m so glad that you’ve mentioned Phil Rickman on your website. I love the Merrily Watkins series and I’ve read all of them many times. I especially like to start from the beginning of the series when a new one comes out. I do that with your books, too! Yes, I know, it takes ages each time but it’s well worth it. Have a look at Phil Rickman’s other works as well – the spookier older books he published as Will Kingdom, I think, and his more recent book about John Dee. Excellent stuff. 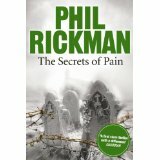 Phil Rickman also broadcasts a book show on BBC radio. You can hear it all over the world from the BBC IPlayer. (bbc.co.uk/iplayer) Phil Rickman’s show is called ‘Phil the Shelf’, and he interviews authors and reviews books, as well as giving putative writers a start and a helping hand. Well worth a listen. I must look out my old, dog-eared copy of Wine of Angels now. I feel an inulgence coming on…..
I’ve just been reading your blog and saw that you enjoy Georgette Heyer’s books? If so you might be interested to know that there is a new biography out by Jennifer Kloester (an Australian author) of which I’m half way through. It’s a well written and researched book that I’m finding fascinating. As I’m a 4th generation reader of her books – all the females in my family love her books – it’s interesting finding out about the person behind the books! On a side note I also wanted to say how much I love your books and regularly check your website to find out your latest news. The last 20 years of my life have been enriched by your books and the characters you bring to life so well. Diana! I love your books soooo much! Keep on writing pleeeease! How do you Find your history sources? Oh and i want to help you and say that in Dragonfly in Amber, or the beginning Of Voyager, Claire thinks back at an episode Of Greys anatomy, but that tvshow wasnt aired during the 40′s and 60′s. Not what i have found. I find historical sources all over the place: I have about 1500 books in my “core” reference collection, which I use all the time (if any of you are Truly Interested [g], you can see my whole collection on Library Thing), but I also do a lot of research online, and some by going in person to some of the places I write about, visiting museums, and collecting pictures and regional publications. Um….Claire is not thinking of the television show. There is a classic book–an atlas of the human body–called GREY’S ANATOMY (the TV show is named after this; it’s supposed to be a joke), and that’s what she’s talking about. Anyone in the medical field would be familiar with this book. I have one question, do you know when the swedish translation of the Scottish Prisoner come out? I´m very good in english, but i think that i would lose lots of important details if i read it in english, AND it would take time. perhaps you don´t know, but it would be great if you did. and also, it´s very hard to find Lord John Grey´s series here. i´ve only read lord John and the private Matter cus they´re so hard to come by. Oh, and i´m rereading the whole series, crying and laughing till my fiancée gets irritated on me. i also think he feels threatened by Jamie haha. I also got my friend to read the series and she´s totally in to it. not as much as i though(she´s never had an interest in history but the love between Jamie and Claire is so dear to us both). How do you get your inspiration? from other books and movies? from your own life? keep up the awesome work and take your time. don´t stress. in Sweden we have a saying “den som väntar på något gott väntar aldrig för länge”(“He who waits for something good never waits for too long”). I also want to say that your books gives me inspiration to write, although my ADHD makes it hard for me to keep going on one thing, i always start all these different stories and never finish them, and i´m really lousy at dialogues and twists. One last thing, do you have a very good tip for a book that´s not too much fantasy but more of the “logical” fantasy like your books. I really love history, love(a bit sexiness) and small magical happenings or wicca-things, but not in the Lord of the rings-kind of sense. it´s too much and i can´t read it without getting really into it cus is so unlikely. you´re books swallow me whole and i can picture everything so clearly in my head. and it makes me think of all the unknown worlds that are out there. Eszter, 22 year old from northern Sweden, who reads your books during cold winternights and dreams of a love that never cease to exist.